Rotana, a leading hospitality management company in the Middle East and Africa region, has signed a contract with Mauritanian firm Al Majmoua Almouritania pour l’Investissement (MMI) to manage its 5-star hotel in capital Nouakchott. The hotel, to be located within the Ribat Al Bahar project, will open under Rotana’s “Rayhaan Hotels & Resorts by Rotana” brand, said Makram El Zyr, the corporate VP (Development) Rotana after signing the agreement at a ceremony held in Abu Dhabi. "Since its inception, Rotana has grown to become the largest hospitality management company in the region – a brand not only widely recognized, but much admired," he remarked. El Zyr pointed out that the impressive growth in the number of Rotana properties was powered by a consistency in ‘getting it right’ first time, every time. "The company’s strategy is geared towards having nothing less than one property located in every country in the region," he added. El Zyr said the agreement represents an important achievement for Rotana, and is a major milestone in its strategy to expand in the African and Maghreb markets. "The new “Rayhaan” hotel is our first property in Mauritania which is a growing business and tourism market with a strong demand for 5-star hotels that offer world-class hospitality. This sea-front hotel will represent an impressive addition to the city’s hospitality offering for both leisure and business guests,” he added. Khaled Al Aboudi, the chairman of MMI, said, "Rotana has not just been chosen as a partner for being a hospitality pioneer in the Middle East and Africa, but also for its deep understanding of Arabic and Islamic culture and values, evident in the development of its “Rayhaan Hotels & Resorts by Rotana” brand – already a proven success in Saudi Arabia and the UAE. The hotel will be developed on the southern sea-front of the mixed-use Ribat al Bahar project and will include more than 230 rooms, specialized restaurants, meeting rooms, swimming pools, and a gym, in addition to all the services expected of a world-class 5-star hotel, said a statement from Rotana. 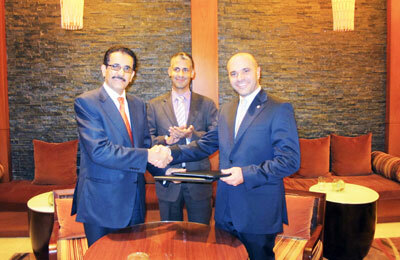 Rotana and MMI are working rapidly on the design process to ensure the speedy progress of the project. The hotel is slated to open in late 2014, it added. Rotana currently manages a portfolio of over 70 properties throughout the Middle East with an aggressive expansion plan in place.